I don't agree Fifi. u have to thank them. what if,if they don't give any response like any other questions of people ? የኢትዮጵያ አየር መንገድ ደንበኞቹን ለማስደሰት የሚያደርገው ጥረት የሚያስመሰግን ነው፡፡ የኛ ባይሆን ይቆጨን ነበር፡፡ "ጥበቡን በልቡናችሁ፣ መልካሙን መስተንግዶ በአውሮፕላናችን ላይ ያሳድርብን፡፡ አሜን፡፡"
Deacon Daniel! A "watch dog" of his people,a well articulated and proud Ethiopian.Really "eagle eyed" indeed that locates where some crucial and peculiar necessity for Ethiopians has slipped off the right track. A devoted advocate of his fellow country people.Keep on weeding out the diabolic acts of bottle neck bureaucracies to the root. Wow! that's really amazing. I cannot believe it such a down to earth response after admitting an error from an Ethiopian company.The label "world class company" deserves them perfectly.The saying,"To err is human to forgive divine" completely fits here.This company is special and I'm really proud of it. Most Ethiopian companies don't have such an attitude.If anyone ever tries to point out where they made an error whether by accident like that of Ethiopian Airlines case, or out of negligence they just overreact. They blame you and label you as a cause for their folly.What can you do when a bolt rigidity strikes you unexpectedly? Nothing. You just feel sorry for their immaturity and leave them to play with their baby things. ዳንኤል የአንተን ቅራኔ፤ በጽሑፍህም ምክንያት ይሁን ወይም ሕሊናቸው ቀስቅሷቸው ይቅርታ መጠየቃቸው ያስመሰግናቸዋል።የሚቀጥለውን ብሶታቸውን 15 November 2012 ላቀረቡት አቶ Joe Crane (USA)እንደዚሁ ይቅርታ አቅርበው ይሆን? "At one time, I was a gold member with Ethiopian Air and left due to the poor plane quality, treatment of business class customers and staff. This was more before their Star Alliance designation and new fleet. Unfortunately, it does not seem much has changed. On the 6 hour flight from Johannesburg to Addis, the business class seats barely recline, meal service takes most of the flight and there is no personal entertainment system which is standard on most economy flights let alone business. Lounge in Addis which should be their flagship is still overcrowded with slow internet and no priority boarding for business passengers. On the plane from Addis to Nairobi, my original seat was taken when I boarded. I asked the flight attendant and simply redirected me to another seat even though I was originally seated next to my wife. Very little room for overhead luggage so the stewardess said she would take care of it. I asked her not to put my bags in the back and she agreed. I look behind and she is already halfway down the plane. I hope the Star Alliance designation will eventually force a higher standard. Until then, Ethiopian remains a carrier of last resort." ‹ጠላት ያማል ወዳጅ ይወቅሳል› We proud of u, Good Job also Ethiopian Airlines Excellent Job taking the complain and take immediate action, We proud of u as well. May God bless u all. "ጥበቡን በልቡናችሁ፣ መልካሙን መስተንግዶ በአውሮፕላናችን ላይ ያሳድርብን፡፡ አሜን፡፡"
ነገር ግን ዳንኤል ይህንን ለብዕር ፍራቻ የተደረገ ምላሽ ብቻ እንደሆነ አድርጌ ነው የማየው::አንድ አሳዛኝ ክስተት ላንሳልህ አንድ ጓደኛዬ ገንዘብ ተዋጥቶለት በልመና የልብ ቀዶ ጥገና ለማድረግ ወደ ህንድ ለመሄድ በዚሁ አየር መንገድ ደካማ አሠራር የተነሳ ከበረራው ሳይሆን ቀረ:: ቀጥሎ ለመሳፈር ያለውን ብሮክራሲ አሁን እዚህ ላይ አልዘረዝረውም፤ የሚያሳዝነው ግን በዚህች ስህተት ምክንያት መሳፈር ባለመቻሉ ቀዶ ጥገናውን ሳያደርግ ቀረ ሕይወቱም አለፈች:: ይህንንሳ "በብዝነስ ክላስ" ይክሱት ይሆን? "ከአምላክ የመጣ ጥሪ ነው እነሱ ምን ያድርጉ?" እንደማትለኝ ተስፋ አደርጋለሁ:: ተገቢ አገልግሎት ለማግኘት አየር መንገዱ የሚጠይቀው ክፍያና መስፈርት ከማሟላት ያለፈ አንድ ተሳፋሪ ማድረግ ያለበት ጠጨማሪ ነገር አይታየኝም:: ያሳዝናል!!! እነ ቴሌና መብራት ሃይል እነ ገቢዎችና ወረዳዎች ምነው እንዲህ እርማት ሲሰጣቸው ወዲያው ማረም ቢችሉ የት ይደረስ ነበር ? << በቢዝነስ ክላስ >> ምን ማለት ነው ? hmmm....what you talking about D.Danial? what about others who do not have blog like you? Do you think the other 19 people get the same sorry phone call and next fight 1st calss service? Do you think you got sorry call coz of ur gold card? plz let see some change before we thank them. They desrive thank you when they try to fix thier peroblems. How many people care how the hostess is butiful while she don't have good smile and respect. They even didn't try to give us fruit or berad while I were face same problem what u got, i also didn't get sorry call. BTW when i read ur comment about it, i were happy coz we need such kind writer who could see people problems and bring to public, which will help to eliminate our peroblems. You have a best viwes keep it up D.Danila. Thanks!!! Hope other government bodies as well listen to our comment and critique for mutual understanding and betterment of our country. 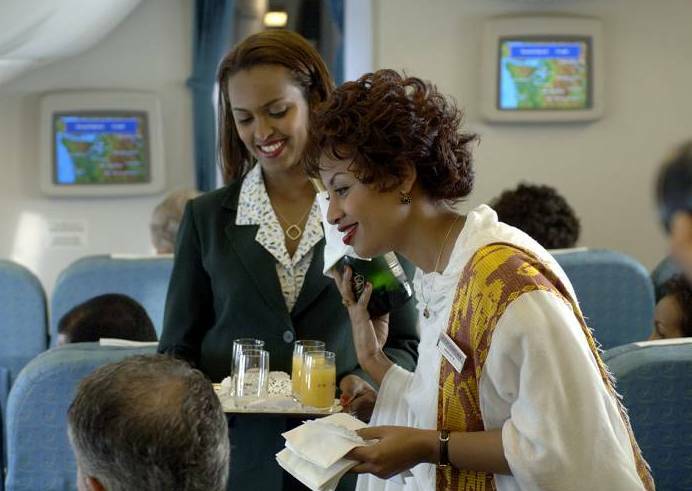 The hospitality observed in the photos above depicts the real feature of Ethiopian airway hostesses. They provide the warmest service for whites. That would have been awesome, had not it been at the expense of Ethiopian basic service requests. Ethiopian airway cannot afford losing its Ethiopian customers. Therefore, the management should train their hostesses to bring about real change in the way they treat their guests irrespective of colour or other economic criteria. !!!! የኢትዮጵያ አየር መንገድ የኛ ባይሆን ይቆጨን ነበር !!!! But not for me. I always fly Luftanza just because some employees treat me differently.In addition I get excellent service at German Air plane.Shame on Ethiopian/Weyane airliens. D/Daniel:GOD BLESS YOU . PLEAS BE STRONG AND DON'T GIVE UP ! For all Ethiopian passengers: let us have a positive attitude and understanding because the airline belongs to all Ethiopians. please understand the employees, it is a life full of hardship!!! Wish u a safe and pleasant flight at all times.